At one point in his three-part Channel 4 TV series on ‘The Secret Life of Buildings’, Tom Dyckhoff showed us images of pitched Parisian street battles from 1968, to which French architecture attempted to respond through the young Richard Rogers’s Pompidou Centre, conceived (as Dyckhoff remarked) as a ‘building for the people’. Might we then expect to see architecture, Morris’s great art of arts, respond to our recent riots? Dyckhoff is a cheery, chirpy presenter and his series was entertaining and illuminating in equal measure. He examined the effects on human well-being of domestic, work and leisure buildings by wearing mobile eye trackers through a shopping mall, having an EEG cap strapped to his head in an open-plan office, and even by being doused in an ice-cold bath for as long as he could endure in different architectural settings. The programme on working spaces was in the grip of a spatial ‘reformism’ which was all about introducing architectural wit and variety within existing power-relations. Dyckhoff showed us how you can ‘de-institutionalise’ prison-like old schools with colour and anti-geometry in ways that will calm troublesome kids down (perhaps this will work with rioters too); just as, over in Europe, you can brighten up – or even combine - office and industrial spaces in ways that improve staff morale (BMW’s factory in Leipzig). But there is all the difference in the world between redesigning a building to maximise your workers’ comfort, efficiency and productivity under capitalism; and designing a space, in post-capitalist society, in which workers may democratically govern their own production processes (see Morris’s own utopian writings on factories as they ‘might be’). However, the first programme on domestic buildings had made more telling political points, noting that since 1980 there has been no legal minimum size for UK houses and that we are accordingly building some of the smallest and worst-lit dwellings in Europe. 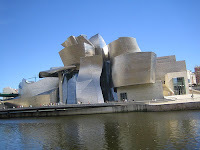 And the final programme on leisure buildings was more radical still, as Dyckhoff denounced 1980s ‘free market fundamentalism’ and tackled leading architects such as Frank Gehry and Rem Koolhaas about buildings (like the Bilbao Guggenheim, illustrated above) which are zany high-tech spectacles rather than genuine social spaces, which latter he found exemplified by the demotic idiom of the 1951 Royal Festival Hall in London and, as I have noted, the Paris Pompidou Centre. Architecture alone will not solve our present violent social discontents, as Morris in his socialist phase knew well enough; but since he always was so concerned for its ‘prospects ... in civilisation’ (to borrow that lecture title), we might well now wonder whether it will find creative ways to respond to the riots we have just witnessed. Can video-gaming technology truly ‘democratise the process of architecture’, as Michael Kohn claimed at the end of Tom Dyckhoff’s fine series? In the days ahead we shall find out. But your right it does matter so much - most commercial architecture and town planning is so poor in quality and ambition. Yes, good point - town planning/city design are indeed key here. 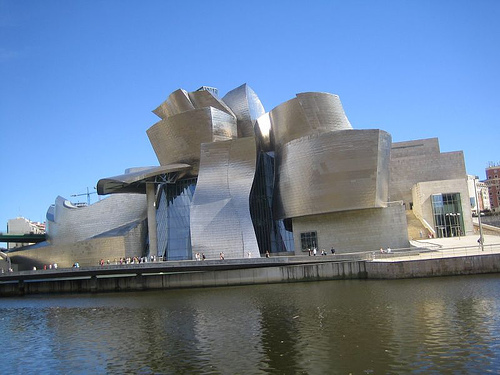 Tom Dyckhoff did tend to concentrate on isolated buildings rather than the bigger, more holistic urban issues.